I have with me today Big Ted. He is the same age as my wife give or take a few weeks, which means he is still relatively young. However it must be said he is a bit ragged. 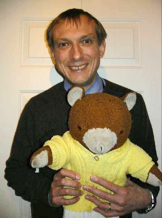 I think when she was a small child she hugged Big ted a lot and he has moved house a lot and to be honest he is a bit frayed around the edges. So I did suggest we should replace him, decent quality teddy bears are quite easy to come by these days, and we can afford a new ted. Well Caroline's reaction was one of horror, she loves her Big Ted and we will not throw him in the bin and replace him, despite his raggedness! We are all ragged bears in some ways aren't we, we are not the perfect Steif models you can buy in the shops. Yet like this bear we are deeply loved by God. That is Grace. Yet we often forget that, we see our raggedness and want to cover it up, by appearing to have it all together be it with wealth or an appearance that we have followed the rules of the Christian church. We live in fear and are trapped by the need to appear good, thinking we have to earn respectability and love. However God loves us anyway and if we truly believe in that, we have freedom through his Grace. The churches in Galatia had accepted the Good News of God's grace for all people. However over time new teachings had taken hold, telling people, that to be really sure of God's love that men needed to be circumcised, there was certain food that people could not eat and certain traditions to follow. These false teaching had turned the Good news of Grace and hope into fearful religious legalism. We are going hear today about the Good News of God's love that Paul shared with the churches of Galatia, how they were turning away and how they could turn back to hope and freedom from their fears. Paul is writing to the churches of Galatia in Asia Minor. He greets them by stating the core message of the Gospel. 'Grace and peace to you from God our Father and the Lord Jesus Christ'. Paul wishes the churches in Galatia Grace and Peace not from him but from God the Father and the Lord Jesus Christ. For that is indeed what God the Father and the Lord Jesus Christ wish upon us all, Grace and Peace. If anyone was wondering whether or not to believe this statement then Paul reminds the Galatians, 'the Lord Jesus Christ, who gave himself for our sins to rescue us from the present evil age, according to the will of our God and Father.' God loved us so much that he gave his son to die on the cross, so that we might have life. It was important to remind his readers of this for Paul thought that many of them may have forgotten this very important fact. Paul knew about grace, he not only went against some of the concepts of the Gospel in his personal life but he actively persecuted the church, approving when Stephen the first Christian martyr was stoned to death by a mob. Paul knew what it was like to be ragged. Yet Jesus called him to be used in his kingdom and take a leading role. It is bit like the European Union asking Nigel Farage to run the European Commission. Paul Jesus' arch enemy was given a key place in Christ's kingdom not because he earned it but because he was called. We cannot earn Christ's love he loves us just as we are and he has a plan for our lives that will grow his kingdom and grow us in the joy of his love but it won't make him love us anymore than he already does. As clear as this message was, the Galatians were turning away from the Gospel and God's Grace. Paul writes in verse 6, 'I am astonished that you are so quickly deserting the one who called you by the grace of Christ and are turning to a different gospel' Paul wastes no time in getting to his point, there is a sense of urgency in the letter. Paul goes on 'Evidently some people are throwing you into confusion and are trying to pervert the gospel of Christ.' Paul was sure that the churches in Galatia were being led astray. We read later in the letter that they were being told that they needed to follow Jewish traditions and in this way that they can gain full acceptance and approval by God. Paul knew this was dangerous, because it would enslave the Galatian churches into traditions and rituals that were not necessary to gain God's approval. The Christians would lose their freedom in Christ and something else would happen, by sticking to all those traditions, they would have a false sense of superiority over others who did not follow those traditions. It still happens today, we forget that we are loved as we are. We try to portray an image that can be very stressful to maintain. Do you remember the Full Monty that came out some 19 years ago? These men made redundant in Sheffield from a steel works. Gerald Cooper a manager was also out of work and he lived in a Middle Class suburb of the city. He lost his job but could not tell his wife, he left the house every morning with his packed lunch and suit on, only to go to the job centre to look for a job that never came. His wife found out when the debt collectors came for the household white goods. He forgot he was loved as he is, for all his raggedness and for all his lack of employment, yes lack of money brings very real practical issues in making ends meet but does not mean that you are loved any less! We often think we have to appear to have it all together, to live the perfect life in order to be respected, that's what the Galatians were told and were beginning to do. Sadly there are too many examples of the church in our own time implicitly having rules and traditions that enforce a code of conduct that makes us forget about God's grace for us. It is so easy to fall into the trap that I have been to church many years, done so much, know so much and think that I am OK with God. Let's not enslave ourselves to appearing good, let's be open and honest and welcome God's love into our lives. Paul accepted grace in his life, he writes in verse 12, 'I did not receive it [Grace] from any man, nor was I taught it; rather, I received it by revelation from Jesus Christ.' It was on the road to Damascus that the risen Christ appeared to Paul and called him to ministry yet Paul had to accept that grace and accept God's call for his life. In our Gospel reading today we hear the story of the centurion who needed Jesus to heal his servant. The centurion's men come to Jesus to ask him for help, notice the reaction of the Jews, 'This man deserves to have you do this, because he loves our nation and has built our synagogue.' The Gentile Roman soldier had contributed so much, he had given of his wealth and he had been good. Therefore the Jews said he had earned the help of Jesus. So Jesus goes but the centurion sends word and he says, ' I do not consider myself worthy to come to you. But say the word and my servant will be healed.' When Jesus heard this he was amazed, ' I tell you, I have not found such great faith even in Israel.' The Centurion knew about God's grace and he knew even more about God's grace that day when his servant was healed. Accepting grace takes faith, we need to keep reminding ourselves of it, we need to step out in faith, because we can let go of things that we hold onto because we think they makes us loved. It is a bit like learning to swim, I was late 11 years old before I could swim so I remember, not wanting to let go of the side, armbands not coming off, always wanting to use the float. Letting go of these things was difficult and what an achievement when at the age of 11 I got my 10m swimming badge without any floatation aids. As I gained in confidence then more badges came. So it is with faith as we step out knowing God loves us, we can let go of the need to pretend all the time, it is OK to move to a smaller house because we can't pay the mortgage on the big house, it is OK to share something that we might be ashamed about in our past, it is OK to be ragged, because we all are and we are all by God's grace loved more than we can possibly imagine. So I invite you all to come in the next weeks, get involved in a group, learn more about God's grace, God's love for you, and why trusting and believing in his grace gives you freedom. Amen.